Offering Edge Finder. 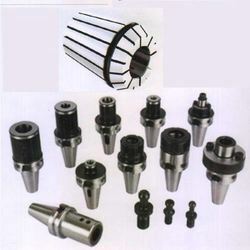 Edge & Center Finders are used on jig boring or vertical milling machine before starting up of operation for positioning the central axis of the spindle, in which tool has to be mounted. These are time saving positioning tools used for accurately locating work edges, shoulders, grooves, center points & scribed lines. The purpose of edge finders is to find exact position of a work piece with respect to the spindle of a milling machine. Allcon India is the prominent leader of manufacturing high performing Mechanical Edge Finder. With the help of our experienced craftsmen, we are able to design, develop, supply, export and trade high grade quality Mechanical Edge Finder. Electronic Mechanical edge finder are available with us immediately. Price varies from Rs 300/- to Rs 5900/- based on the specification of the products. TOOLFAST’ Edge Finder is used for fast and accurate location of starting point of work pieces with respect to the machine spindle on milling or jig boring machine tables. The shank is electrically conducted to the metal workpiece through the chuck and table, the LED lights up and the beeper sounds(only for 6566-3), when the ball touches the workpiece. Not suitable for rotary use. 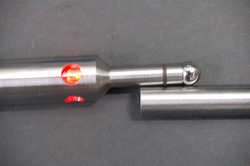 • Edge finder lights instantly when stylus touches work edge. • Six equally spaced light ports provide visibility at any angle. • Read off any electrically conductive metal. the LED lights up and the beeper sounds, when the ball touches the workpiece.